GRETCHEN HARRIS,Unity Award winner for "Female Vocalist of the Year" 2006, is a singer/songwriter who expresses through her music her deep love for God and Church. Songs from her six CDs can be heard on Christian radio stations in the United States and in many other countries, in addition to the worldwide radio outreach of EWTN. WINNER - "POP/CONTEMPORARY ALBUM OF THE YEAR"!! Gretchen Harris was moved to create a soothing album for the hurting soul when her friend was discovered to have a brain tumor. She felt called to put together a group of songs with lyrics that illustrate God's love for his suffering souls. She wanted to focus on God's gift of Hope, in this life and in eternity. What was created is Gretchen's third album, "Hope for Tomorrow," joining again with producer David Harris. They offer eleven beautiful selections, including one they co-wrote, to convey the message of peace in confusing, troubled times. The theme of the album became even more fitting as the events unfolded following the September 11th attack on the United States. The album starts with "I Am," a song written from the perspective of God, saying "Oh, gently lay your head upon my chest, and I will comfort you..." Bob Cowsill, of The Cowsills fame, joins Gretchen on a duet verse. "Hungry (Falling on My Knees)" is a song of total offering of one's self in prayer, even when hungry and broken. The classic "Take, Lord, Receive" is affectionately revived with harmony vocals artfully sung by vocal group Spirit Alive. "Child of God" shows how, in the hardest times, Jesus simply holds us through it all. Phil Keaggy was the writer and inspiration behind the recording of "Reaching Out," a simple song of wonderment at the phases in life, and how we need to reach out God's hand to those in need. John Michael Talbot's well-loved "Only In God" is a statement that God alone is our stronghold and our safety. The song is presented against the backdrop of a drum groove; with scripture verses and electric guitar woven through the interlude, this is a very moving piece. The meditational "You Bless Me, Lord" perfectly fits the lyrical theme to the album, with the simple statement that God blesses us and we are His, even through the gravest circumstances. The percussion of Steve Reid, founding member of The Rippingtons, is showcased here. Liam Lawton's "The Cloud's Veil" has a message that "Even when the rain hides the stars... You are by my side." Piano and harp are featured, with Gretchen on harmony vocals. Amy Grant wrote the comforting "Carry You" that calls us to lay down our burdens and allow ourselves to be carried by Jesus through the hard times. "Life After Death" was written by Gretchen and producer David Harris, as a sweet story of her mother's recovery and healing following the death of Gretchen's father. And the album finishes with an affirmation of God's healing power from Chris Eaton's "Wonderful World." It is Gretchen's prayerful intention that she may minister through these songs and offer comfort, hope, and peace in Jesus Christ to all who listen. 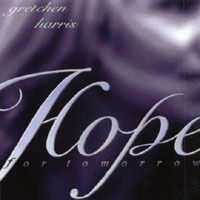 Hope For Tomorrow, by Gretchen Harris, is one of those CD1s that gathered a new meaning after the attack on America. Gretchen was moved to create a soothing album for the hurting soul when her friend was discovered to have a brain tumor. She felt called to put together a group of songs with lyrics that illustrate God's love for his suffering souls. It was to convey the message of peace in confusing, troubled times. Then September 11th happened. It's times like these when you need to be held in the arms of your loving Father. To be a "Child Of God" in the hardest of times is what Gretchen sings about with beautiful vocals and accompaniment. The cello in this song is awesome. Another song about our loving Father is the song "I Am". "Drop that heavy load...I know you through and through, no need to hide, I want to show you love that is deep". It is a song that has a folksy flavor to it, as Gretchen is joined by singer Bob Cowsill (of The Cowsills). Following the theme of a loving God is Amy Grant's song "Carry You." The song states you should "lay down your burden" and allow yourself to be carried by Jesus through the hard times. One song that really stands out on Hope For Tomorrow is "Life After Death." It was written by Gretchen and producer David Harris, as an appealing story of her mother's healing following the death of Gretchen's father. The sweet vocals tells of God's grace and His peace to carry on after such as loss. I was blown away by Gretchen's previous CD, Sing of Mary. It was a beautiful collection of Marian songs giving praise for Our Blessed Mother. I was worried that this new CD would not match it. I was pleasantly wrong. Hope For Tomorrow to me personally is the flip side of "Sing Of Mary," with songs about God the Father. These CDs should be side by side in your collection. Gretchen was nominated in 2002 for the Unity Awards "Female Vocalist of the Year" and "Artist of the Year." She won for "Pop/Contemporary Album of the Year." In 2001, she was nominated for "New Artist of the Year." Gretchen's previous awards from the UCMVA were "Song of the Year" and "Video of the Year" for the song "This Is My Body" with the Irish singer DANA. Gretchen ministers through concerts, speaking engagements, and radio programs, performing most recently in Washington DC, Toronto, Brazil, Florida, and her hometown of Los Angeles. Hope for Tomorrow is truely an inspirational CD. It relaxes and brings peace to your soul. All the songs are fresh and uplifting. Bring peace to my car or to my home, where ever I am listening! What a joy to hear my 3 children singing and worshipping God with me!